So let’s get started by first taking a look at the build quality and features of this new camera. 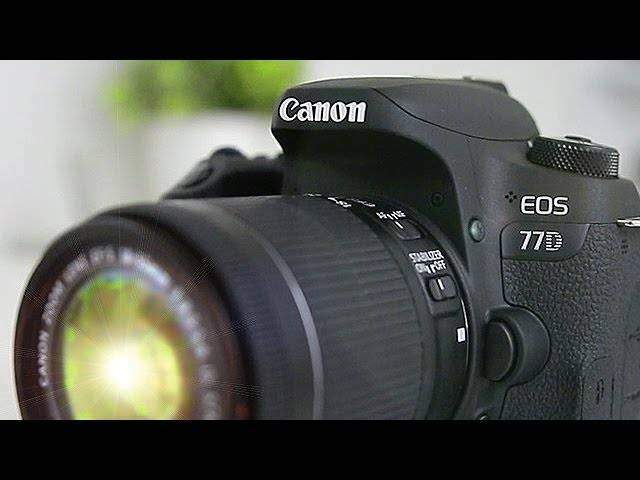 Now if you’ve ever used a rebel series camera from Canon, you’ll feel right at home with the 77D. It’s got a great feel to it when you first pick it up in your hands. Compared to the older Canon T6s, which is the predecessor to the 77D, not too much has changed in terms of the feel of the camera. And that’s a good thing I think. The 77D is right in that sweet spot size for a DSLR. It’s not a small as a micro four-thirds camera or a smaller DSLR like the Canon SL1 but it’s also not as heavy as cameras such as the Canon 70d or 80d. Buttons are where you’d expect them and are easy to navigate and the menu dial at the top here has all of the manual and auto settings that you’d expect. So overall the build on the 77d is great and should work well for most users. Award winning instructor and professional wedding photographer Michael Andrew takes us on a step-by-step tour of the Canon 77D / T7i in this limited edition training video. Michael Andrew’s unique approach simplifies SLR digital photography and shows students how to use simple techniques to take amazing photographs.